I will admit it, breakfast in our house can be a bit crazy, especially when my oldest is at school. TechyDad is busy getting ready for work, NHL is eating breakfast before school and JSL is usually refusing to anything/everything we ask him to eat. Some mornings, it is cereal, breakfast bars, waffles or even yogurt. It really depends on what we have and how much time is left before running out the door. 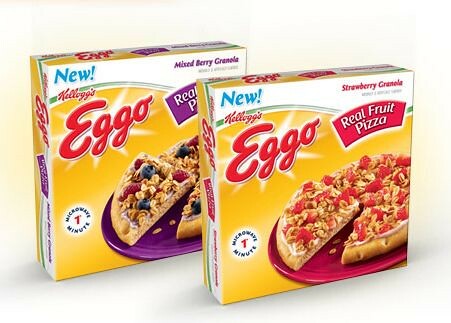 When I was asked by Mom Central to try the new Eggo Real Fruit Pizzas, I jumped at the opportunity. Both of my kids love pizza, they like Eggo products and it was a chance to get them to eat a little fruit. 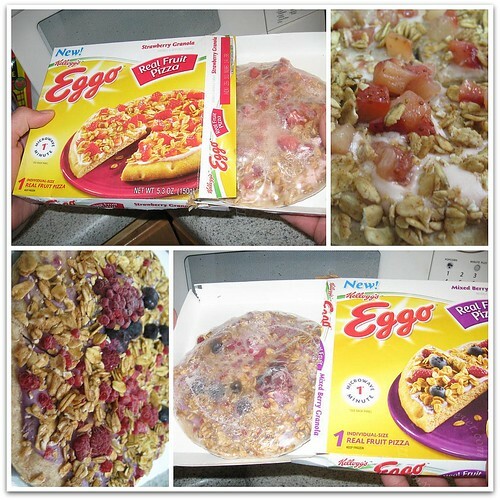 Eggo Real Fruit Pizzas after just one minute in the microwave. The Strawberry Granola has 400 calories and the Mixed Berry Granola 390 – both made with real fruit. They are now available in the freezer section of the grocery stores. One item I noted in particular, they also contain 4 grams of fiber in each pizza. The large amounts of fruit that NHL, TechyDad and I saw as a fabulous perk sent him screaming from the table. He chanted "Me no eat pizza!" *sigh* That left us with NHL having it for dinner and the two adults snacking on some with him. 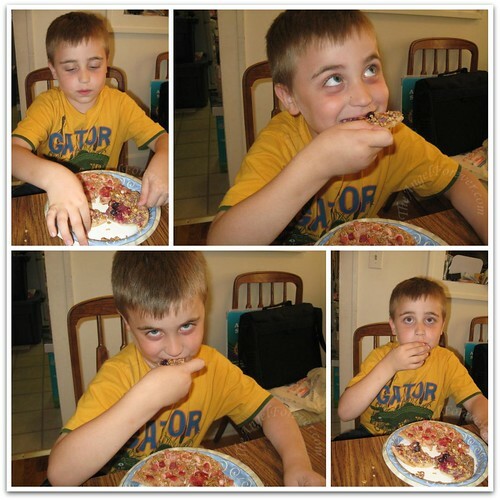 Here are some photos of NHL as he was devouring the fruit pizzas. Please excuse the goofy shots, he was trying to make me laugh as I was taking the photos and it worked nicely. NHL thoroughly enjoyed his Eggo Real Fruit Pizza halves. I was lucky I snapped pictures quickly because they disappeared before I blinked. When asked which was his favorite, he said strawberry since they are his favorite fruit. I asked if he would like them again and he immediately wanted to know if we had more in the freezer. 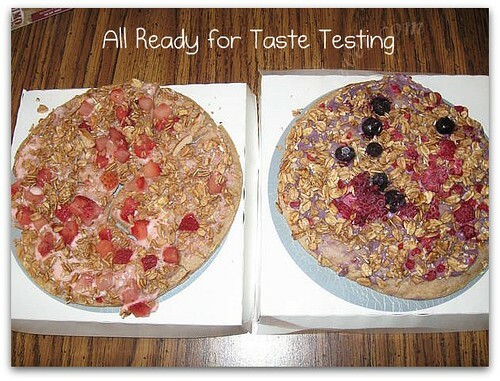 Since JSL was not eating his, TechyDad and I both were able to sample his part of the Eggo Real Fruit Pizzas. I really liked the taste of the fruit, granola and "sauce" (not sure if it was yogurt or a strawberry cream cheese). With the strawberry variety you really could taste all of the different flavors coming together to make this unique breakfast option. Although I liked the Mixed Berry Pizza, I thought that the tart raspberry presence was a bit overwhelming. Verdict: We would definitely buy these again. I like that they are easy to make and have real fruit and four grams of fiber in them. Next time I am at the store and see them, I will grab a few for NHL with the hopes that JSL actually tries them next time. Disclosure: I wrote this review while participating in a blog campaign by Mom Central on behalf of Eggo Real Fruit Pizza and received samples to facilitate my candid review. Mom Central will also be sending me a $20 Amazon gift certificate to thank me for taking the time to participate. Wow, that looks delicious! I would eat them! Holly at Tropic of Mom´s last blog post ..Caterpillars- metamorphosis- butterflies!